Have you ever wondered what tomorrows bathroom will look like? Will there be a radical change? Rather than just being a space where people can groom and clean themselves the bathrooms of the future are likely to become a lot more interactive and linked to the masses of information we receive in other areas of our lives. But which technologies will futuristic bathrooms incorporate? Drawing on predictions by designers of futurologists, a report was put together which suggested that bathrooms of the future are more likely to become high-tech. The report, compiled for bathroom provider ideal standard international, showed how people’s behaviour and the use of the bathroom is changing. Amongst other innovators the designers have pointed out some of the technologies which may be seen in a few years time. Interactive mirrors are going to be the next ‘big thing’ in future bathroom designs. The interactive mirror will be the first to greet you in a morning. The mirror will interact with children brushing their teeth, providing them with step by step guides, or simply encouraging them to brush everyday with cartoon videos. For the older generations, the mirror will assist you by focusing and zooming in on certain sections on the body, for example, you may want to zoom into your eye lid to help you apply eye shadow. Mirrors will be touch screen and interactive, this is a future which will allow us to have ‘iphone like’ mirrors to welcome us every morning. Toilets will become self-sufficient by processing human waste and transforming them into useful resources. The Californian Institute of Technology in the United States designed a toilet with self-powered solar panels which will generate hydrogen and electricity. The solar panels will be strong enough to break down human waste into hydrogen gas which will then be used to provide a backup energy source for night time operation or use under low-sunlight conditions. Not only that, a new and ingenious ‘all in one’ toilet design is on its way. The design acts like a Swiss army knife with the three elements- a toilet, a tray and sink, being able to fold into one compact unit. Toilets are also going to become self-sufficient with their energy usage and will be able to self clean, using steam and UV lights. Showers are a way to get you ready for the day without spending too much time whilst doing so. Well, that was a thing of the past. With new future designs being leaked over the internet it has become apparent that people may now want to spend a little more time showering. 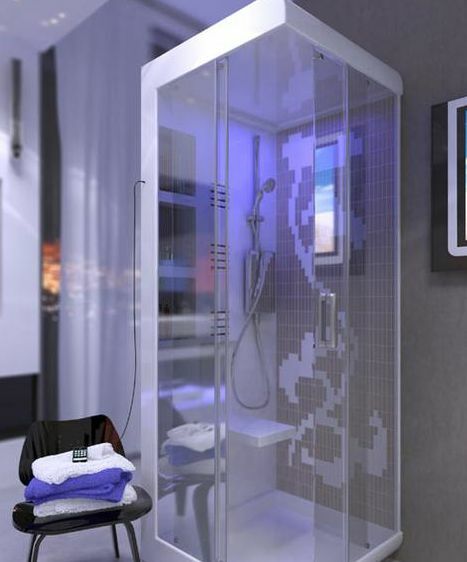 Futuristic showers are looking to have reclining chairs which will help you relax while using their steam facilities. Many shower designers have now been looking at incorporating tanning units of 400 watts along with double UV filters so that owners can shower and achieve the perfect tan at the same time. That’s not all, others are equipping DT VII performance showers with digital menus which allow people to mix up their shower experience, by playing any music through the incorporated mp3 players and controlling light settings according to your mood. A final word. Bathrooms are becoming a lot more interactive and suiting to the personality and characteristics of the home owners. Each fixture of the bathroom won’t just be used for its traditional intentions; there will be other aspect of your personal life incorporated within. Written by our guest blogger Alexandra Jackson.